↑ Figure data, uncorrected absorbance curve fits, from Hart NS, Partridge JC, Bennett ATD and Cuthill IC (2000) Visual pigments, cone oil droplets and ocular media in four species of estrildid finch. Journal of Comparative Physiology A186 (7-8) : 681-694. ↑ Wilkie, Susan E.; Vissers, Peter M. A. M.; Das, Debipriya; Degrip, Willem J.; Bowmaker, James K.; Hunt, David M. (1998). "The molecular basis for UV vision in birds: spectral characteristics, cDNA sequence and retinal localization of the UV-sensitive visual pigment of the budgerigar (Melopsittacus undulatus)". Biochemical Journal. 330 (Pt 1): 541–47. PMC 1219171. PMID 9461554. ↑ Goldsmith, Timothy H. (2006). "What Birds See". Scientific American (July 2006): 69–75. ↑ Neumeyer, Christa (1988). Das Farbensehen des Goldfisches: Eine verhaltensphysiologische Analyse. G. Thieme. ISBN 313718701X. ↑ Robinson, J.; Schmitt, E.A. ; Harosi, F.I. ; Reece, R.J.; Dowling, J.E. (1993). "Zebrafish ultraviolet visual pigment: absorption spectrum, sequence, and localization". Proc. Natl. Acad. Sci. U.S.A. 90 (13): 6009–6012. doi:10.1073/pnas.90.13.6009. PMC 46856. PMID 8327475. ↑ Bennett, Andrew T. D.; Cuthill, Innes C.; Partridge, Julian C.; Maier, Erhard J. (1996). "Ultraviolet vision and mate choice in zebra finches". Nature. 380 (6573): 433–435. doi:10.1038/380433a0. ↑ Bennett, Andrew T. D.; Théry, Marc (2007). "Avian Color Vision and Coloration: Multidisciplinary Evolutionary Biology". The American Naturalist. 169 (S1): S1–S6. ISSN 0003-0147. ↑ Markha, K. R.; Bloor, S. J.; Nicholson, R.; Rivera, R.; Shemluck, M.; Kevan, P. G.; Michener, C. (2004). "Black flower coloration in wild lisianthius nigrescens". 59c: 625–630. PMID 15540592. ↑ Backhaus, W.; Kliegl, R.; Werner, J. S., eds. (1998). "Colour Vision: Perspectives from Different Disciplines": 45–78. ↑ Hansjochem Autrum and Richard Jung (1973). Integrative Functions and Comparative Data. 7 (3). Springer-Verlag. p. 226. ISBN 978-0-387-05769-9. ↑ Roth, Mark (13 September 2006). "Some women may see 100,000,000 colors, thanks to their genes". Pittsburgh Post-Gazette. ↑ "Ask a Neuroscientist: Human Tetrachromacy". สืบค้นเมื่อ 2014-03-20. ↑ Novella, Steven. 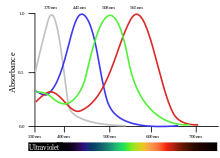 "Tetrachromacy In Humans". สืบค้นเมื่อ 2014-03-20. ↑ Makous, W. (12 October 2007). "Comment on "Emergence of Novel Color Vision in Mice Engineered to Express a Human Cone Photopigment"". Science. 318 (5848): 196. doi:10.1126/science.1146084. PMID 17932271. ↑ M A Mainster (2006). "Violet and blue light blocking intraocular lenses: photoprotection versus photoreception". British Journal of Ophthalmology. 90 (6): 784–792. ↑ Hambling, David (29 May 2002). "Let the light shine in". The Guardian. Thompson, Evan (2000) . "Comparative color vision: Quality space and visual ecology." In Steven Davis (Ed. ), Color Perception: Philosophical, Psychological, Artistic and Computational Perspectives, pp. 163–186. Oxford: Oxford University Press. "Exploring the fourth dimension". University of Bristol School of Biological Sciences. March 20, 2009. หน้านี้แก้ไขล่าสุดเมื่อวันที่ 17 กุมภาพันธ์ 2561 เวลา 14:04 น.